CornerTurn has a product line of small, remotely controlled, power efficient remote tracking devices. The devices are GPS-based trackers that report position & status to remote users. The software provides efficient power control, interpretation of GPS position to determine when the device has moved out of a pre-defined area, monitoring of onboard sensors, and management of redundant antenna systems. The devices vary in size and shape conforming to customer requirements for capability and mounting. Current devices are about 2 square inches by ¼ inch thick including both SATCOM & LOS RF. 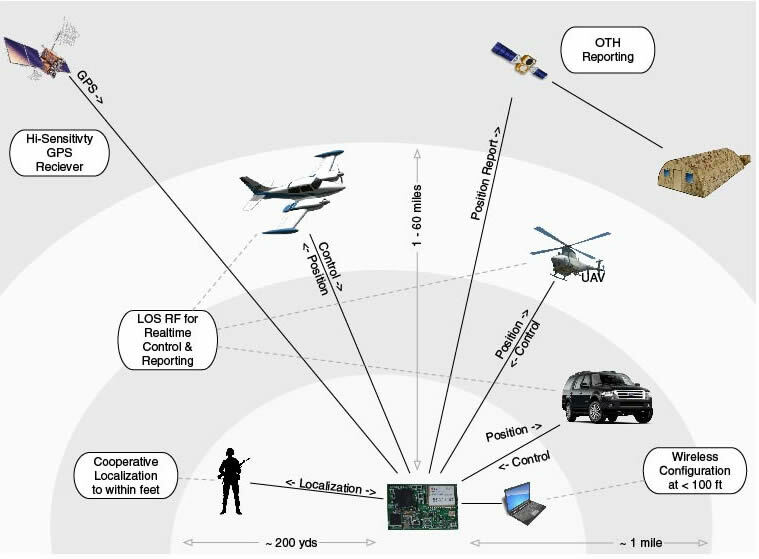 Reporting and control are accomplished via a variety of communications channels including satellite and line-of-sight RF. The devices select between the available channels based on location, signal strength, etc. To date several thousand of these devices (of various configurations) have been successfully delivered and fielded for operational use. Several versions of the tracking devices have been redesigned and delivered for specific customer requirements in as short a time as 6 weeks.